“Iranian militias that are in Iraq, now that the fight against [Islamic State] is coming to a close, those militias need to go home,” Tillerson said on October 22. “The foreign fighters in Iraq need to go home and allow the Iraqi people to regain control,” he added, speaking at a joint news conference with Saudi Foreign Minister Adel al-Jubeir during a visit to the region. Meanwhile, in a television interview on October 22, Trump said he does not object to France and Germany continuing to trade with Iran, despite his refusal to certify the 2015 nuclear deal with Iran. “They are friends of mine. They really are. I get along with all of them. Whether it’s Emmanuel [Macron] or Angela [Merkel],” Trump added. Tillerson, who also stopped in Qatar before planned visits to Pakistan and India, was in Riyadh to attend a rare meeting between Saudi and Iraqi officials. 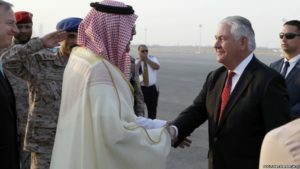 The Gulf trip comes as part of efforts by President Donald Trump’s administration to isolate and contain Iran in the Middle East and beyond. The inaugural Saudi-Iraqi Coordination Council, led by Iraqi Prime Minister Haidar al-Abadi and Saudi King Salman, has been pushed by the United States as a means to counter Iran’s influence in Iraq. Sunni-led Saudi Arabia and Shi’ite-majority Iraq broke relations after the 1990 invasion of Kuwait by Iraq, which was then ruled by Saddam Hussein. Iranian-backed militias have played key roles in the U.S.-supported Iraqi government’s efforts to drive IS fighters from the country. After pushing the extremists out of Mosul earlier this year, troops are mopping up remnants of the group from their last remaining pockets of territory. A senior U.S. official said Tillerson in his remarks had referred to the Popular Mobilization Forces (PMF) and the Quds Force, the foreign arm of Iran’s powerful Islamic Revolutionary Guards Corps (IRGC). Iranian Foreign Minister Mohammad Javad Zarif assailed Tillerson’s comments on Twitter. “Exactly what country is it that Iraqis, who rose up to defend their homes against ISIS, return to?” Zarif said in a tweet, using an alternative name for IS. “Shameful US FP (foreign policy), dictated by petrodollars,” he wrote. “If it wasn’t for the sacrifices of the Islamic Republic of Iran, [Islamic State] would have installed its government in Damascus, Baghdad, and [the Iraqi Kurdistan capital) Arbil by now,” Zarif added during a visit to South Africa. In the Saudi-Iraq council meeting, the countries’ leaders discussed ways of coordinating their fight against IS and how to rebuild Iraq’s shattered economy after years of war. “The natural tendency of the two countries and people is to be very close to each other as they have been for centuries. It was interrupted for a number of decades. We’re trying now to make up for lost ground,” Jubeir said.